if you're anywhere near Ithaca check this out! and if not, maybe you'll be inspired to set up something like this in your area next summer? this one is sliding scale registration fee: $120-200. 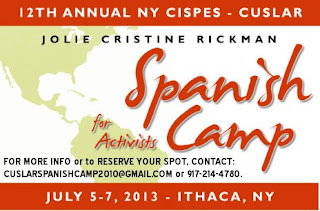 Spanish for Activists Camp features Spanish and ESL English classes, workshops and panels on current social and political issues in U.S.-Latin American relations, as well as music, overnight camping and great food. Learn songs in Spanish in a workshop with singer-songwriter Colleen Kattau on the "Nueva cancion" genre of social justice songs. Michael Fox - Former Editor of "NACLA Report on the Americas"